Amsterdam, 1705. Printed by Moshe, son of Abraham Mendes Cutini. With applied silver binding. 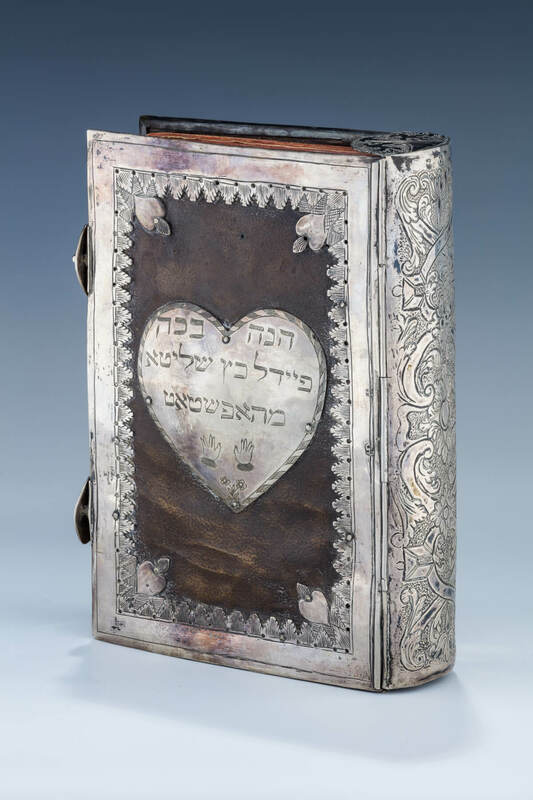 Right cover engraved in Hebrew: “Hannah, daughter of the honored Master Feidel Katz, from Hopstadt”. Left Cover is engraved in Hebrew: “The Revered Rabbi Shimon, son of the Revered Rabbi Isaac, of blessed memory of Anticht. In the year 5565 (1805).” The application, in the shape of hearts indicate that it was a wedding gift. Also decorated with Cohanic hands in priestly form. 7.7” x 5.3”.